Marini is arguably Italy's greatest 20th century sculptor for whom graphic work was a vital component of his artistic output. Freed from the laws of three-dimensional space which govern sculpture, Marini used etching and lithography as a means to express his individual universe with unrestrained drama and vitality. Three essential themes pre-occupied Marini througout his career: the female figure or Pomona, representing an archetypal mother goddess or fertility figure; the horse and rider, signifying Man and the struggle to control his animal instincts, and characters from the circus world which express Marini’s over-riding optimism and humanity’s constant search for an equilibrium between good and bad, life and death. Created in the mid 1930s, Marini’s first equestrian works were inspired by sculptures of medieval knights on horseback and symbolise a primeval or mythical harmony between Man and Nature. In later works made after the Second World War, the riders grow ever more desperate and their horses increasingly nervous, articulating Marini’s increasing horror at the condition of the world. 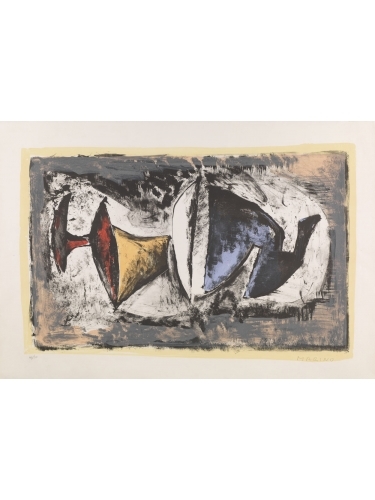 The many etchings and lithographs depicting jugglers, acrobats and dancers reflect Man at his most primitive and naive. Constrained within the space they occupy, the movement of these characters creates tension and drama. A gradual shift from realistic figuration towards more abstract images is an expression of Marini’s increasing inner restlessness and anxiety.